I never used to have too many bananas. I love bananas like I love almost all tropical fruit (mangoes topping the list). Before I was married my mother always bought a slightly underripe bunch and let it sit in a bowl in the dining room. My brother, who is a big fan of underripe bananas (gee, I wonder how many of those are out there? ), can easily go through half the bunch before it ripens. That leaves the rest of us humans with half a bunch of bananas once they’re ripe, which was not much considering everyone in that house loved bananas…including the dogs who could smell them a mile away! And that, my dear friends, did not leave much room for banana bread. If I wanted to make a loaf with the shockingly overripe bananas I knew would make the bread smell amazing, I had to do a little banana-surveillance to make sure that enough of them lasted until they reached such a state. No easy task. Especially as my favorite recipe used 3 cups of mashed bananas, roughly about 7 or 8 pieces. Things have tilted a bit in favor of banana bread since I moved out. With only C and I to feed, and with C at work all day, food moves at a snail’s pace through our pantry. Even if I buy the smallest bunch of bananas I can find, we will still end up with a couple slowly melting into an overripe stupor. Which was just the case a few days ago, with C eyeing the slowly deteriorating bananas warily as I promised to turn them into banana bread. Because there were only 3 left, I couldn’t use my go-to recipe. Thanks to the internet though, I had a wealth of banana bread recipes at the tip of my fingers. One such recipe had already caught my eye. I had spotted it a while back at Café Fernando, a fantastic blog I had stumbled on when looking through HHDD sorbet entries. Cenk is based in Istanbul, Turkey (a place I dream of traveling to) and his blog is filled with gorgeous photos and delicious looking food. Suffice to say I became a fast fan, even more so when I found the banana bread recipe with this photo. Yes, I know, quite riveting if you are a Nutella fan! The recipe comes from Elise of Simply Recipes, tried and true and passed on from friend to friend. And now it’s found its way to my table. It’s simple, delicious, and absurdly easy to make (one bowl, no mixer). It’s not too sweet, which makes it wickedly easy to eat it the way Cenk suggests…I’m sure you can guess how I’m having it right now! Click here for the original recipe at Elise’s. This looks so delicious! 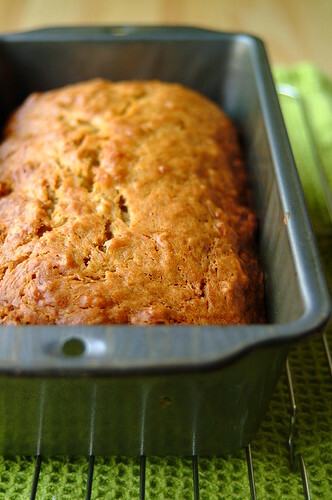 I have been craving a good banana bread recipe. Im curious though to what your go to banana bread recipe is. The one with 3 cups of bananas. I'd really like to know that recipe too please!